The One Breath Dive Expo will host the inaugural edition of the International Underwater Target Shooting Championships. 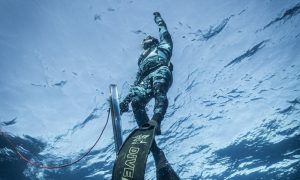 Set to highlight regional and international talent within the freedive spearfishing community, the championship tests a competitor’s ability to accurately use a speargun in a swimming pool while freediving on a breathold. Taking place in a 20-meter bespoke built swimming pool in the center of the dive expo, professional teams and individuals are invited to represent their clubs and countries and compete in front of a panel of spearfishing professionals from the International Spearfishing Academy. Competitors will have to keep their nerve to be in with a chance to be crowned the International Underwater Target Shooting Champion. The winner and 2 runners up will get the chance to freedive in the Ambassador Lagoon at Atlantis, The Palm in Dubai. Better yet, they’ll be able to enjoy this experience with a friend! “We are excited to be judging the International Underwater Target Shooting Championships in Dubai. The popularity of freedive spearfishing continues to grow signififcantly and the One Breath Dive Expo hosting a championship will only create a greater impact on the sports growth.” Said Chris Coates, Chief Technical Officer, International Spearfishing Academy. Diving from the start line, competitors will swim for 10 meters underwater to reach to a shooting line where they, with the support of a weighted object will remain under water for 30 seconds before firing at the target. After retrieving the spear and surfacing, the competitor will then reload the gun at the starting line and commence the next dive with each competitor having 10 minutes to fire three shots.